Opened in 1884, the Supreme Court Library is of architectural, historical and social significance and has one of the largest law collections in the state. Our tours offer an opportunity to learn more about the library and its place in the Supreme Court. 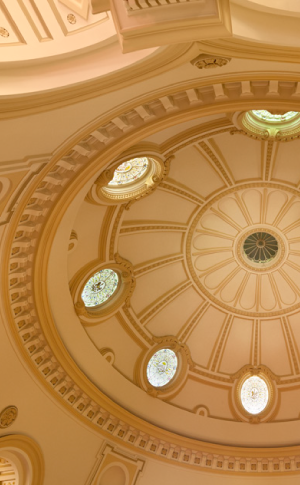 After the tour, we encourage you to spend some time to view our exhibitions and take in the beautiful surrounds under the dome of the Supreme Court Library. The Supreme Court history and heritage tours include a short tour of the Supreme Court Library. Join a Supreme Court history and heritage tour to explore the magnificent heritage-listed 1880s Supreme Court of Victoria buildings and to learn about the Court, its history, and the library. Tour dates and booking information is available via the Supreme Court’s online event booking system. Bookings are essential. Check the websites for further details. For all the latest, including details of tours and events follow us on Twitter @lawlibraryvic.